On 5 April, thousands of Malians took to the streets of Bamako to demand the resignation of Prime Minister Soumeylou Boubeye Maïga and the departure of foreign forces from the country. This followed an appeal by Imam Mahmoud Dicko, President of the High Islamic Council, and the chérif of Nioro, Mohamed Ould Checknè, an influential religious leader based in western Mali. This was one of the biggest demonstrations in Mali since the March 1991 protests for democracy. Several opposition political parties, civil society organisations and unions joined the call. The magnitude of the protests reflects the discontent of many Malians who view national and international responses to the crisis the country has faced since 2012 as ineffective. Repeated strikes have paralysed the education, justice and health sectors. The discontent revolves around abysmal living and security conditions. The current protests called for by the religious authorities add to political tensions born of the July 2018 presidential election and pre-existing social agitation by various unions in the country. Some political actors including Soumaïla Cissé, who was President Ibrahim Boubacar Keïta's main challenger during the last elections, contest the legitimacy of the elected president. Since August 2018, numerous protests have been organised both inside and outside the country to exert pressure on the authorities whom the opposition accuse of electoral fraud. While the opposition are pointing to electoral irregularities, they are also using the protests to sustain their political relevance. Malians' existing grievances and frustrations are being exploited in anticipation of the next elections. The government meanwhile is counting on the erosion of the opposition's capacity to mobilise after a few protests. 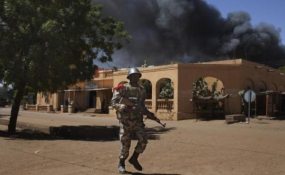 While security in Mali has garnered attention since the beginning of the year, particularly in the centre of the country, the political climate has deteriorated considerably over the past few weeks. The situation jeopardises the implementation of political and institutional reforms announced by the government for 2019 - a process which is key to the country's stability. Among the major reforms are a constitutional review, territorial administrative restructuring, and the implementation of the agreement for peace and national reconciliation. According to the National Institute of Statistics (Mali), between 2017 and 2018 the cost of living increased by 1.7%, with a spike in the cost of housing, water, gas and electricity, which climbed 21.5% in one year. As a result, nearly three out of 10 households believe their living standards have deteriorated, according to the Modular and Permanent Household Survey carried out between July 2017 and February 2018. It is within this context that some Muslim leaders, who had supported the president in 2013 before calling to vote against him in 2018, are demanding a change of direction in the country's governance. They believe the current regime is too influenced by the international community, who determine strategic decisions such as whether or not to negotiate with violent extremist groups. Conciliation has been used to defuse socio-political tensions in Mali in the past. Between 2016 and the end of 2017, the president of the High Islamic Council, together with other civil society leaders, engaged in talks with some leaders of groups regarded as terrorists. The involvement of religious leaders in the orientation and management of public affairs in Mali has also increased in recent years. Conscious of their social and political power, some religious leaders openly demand the departure of political actors who are at odds with their concept of religious norms. In an attempt to quell these tensions, Keïta organised bilateral and multilateral meetings with key political stakeholders in the country. In February this year he met with some political actors, including the opposition leader, Soumaila Cissé. The president said these meetings aimed to restore dialogue with the opposition on major national issues, including political and institutional reforms and security. The meetings were suspended by Keïta but began again on 5 April, this time including Mali's religious and traditional leaders. Key administrative challenges in Mali have grown into emergencies as insecurity thrives on governance failures. Major reforms are essential at the political, institutional and security levels to ensure stability. However these must be based on a common agreement among all sectors of society. Government, supported by the country's regional and international partners, must lead an inclusive approach to reform.